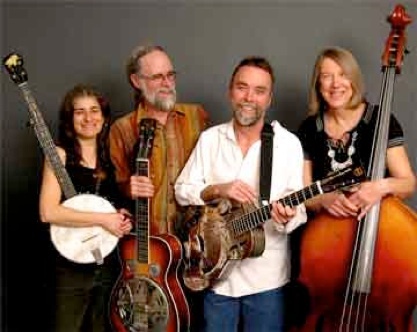 The entertaining and engaging acoustic music ensemble, Augusta Bottoms Consort is a versatile music group playing acoustic music in several styles including old country, jazzy standards, toe-tapping, original songs, folky, bluesy songs and a variety of other musical genre. The four-piece group live near the fertile bottomland fields of the Missouri River in Augusta, Missouri. The sounds of Augusta Bottoms Consort are earthy, thought-provoking, energizing and unique. Lyrics and the band’s rich melodic blend reflect their long relationships as friends who have relished the fun of playing together for more than twenty-five years. 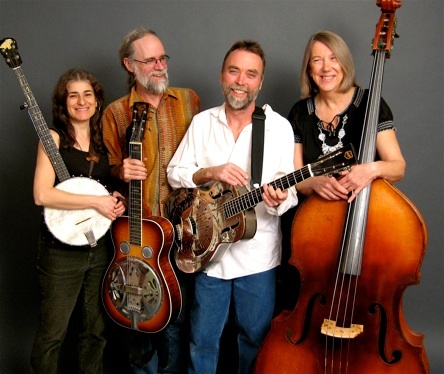 The members of Augusta Bottoms Consort, Gloria Attoun, Michael Bauermeister, Paul Ovaitt and Rebecca Weis Mayer bring to the stage guitars, mandolins, dobro, accordion, banjo, acoustic bass, recorder, panpipes, harmonica, percussion and lots of other gadgets. Their songs conjure up musical landscapes that defy boundaries. See them in the Grolier’s Book of Knowledge under Folk Music. 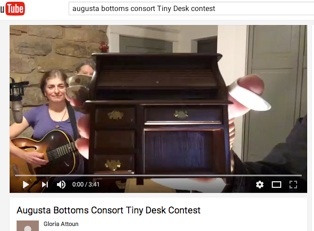 Click the link below to watch “The Pendulum Swing” by Augusta Bottoms Consort! FOR AN INDEFINITE AMOUNT OF TIME! We will let you know what happens next! If you would like to be on our email list to find out about news of all of the music we are doing in other capacities or to purchase any CDs or bandanas, please click here!